I originally titled this Hope Lives Beyond. My focus then was on the colonizing of our lands, our soil, our spirits, the taking of our sacred red earth and using it to build a temple to a god that was not ours. Under the guise of an entryway, forcing us behind a wall that trapped us with a vengeful spirit from a distant continent and kept our own spirits outside, outcast. And all of it, whitewashed, literally and metaphorically, covering the red of our earth, like the red of our skins, with the white of a colonizing force. Then, I was focused on the prospect that hope for our future lay beyond that whitewashed wall. Today, that still holds true, but now, my focus lies further beyond: beyond the dusty tracks of the plaza where our people gather; beyond the red-earth walls and roofs of Hlaukwima, our South House; beyond to one of the real sacred spaces of our people. To the mountain: to the wild game and plant medicine it nourishes; to the forest that provides wood for our homes, our safety, our traditional needs; and to the sky that holds the thunderheads of summer, bringing the rain that sustains us. Signed on white matting; brown wooden frame. Size including frame: 17.75″ by 20.25″. $625 + $100 shipping, handling, and insurance. All content, including photos and text, are copyright Wings and Aji, 2015; all rights reserved. Nothing herein may used or reproduced in any form without the express written permission of the owners. Posted on Sunday, June 15th, 2014 at 11:52 am. 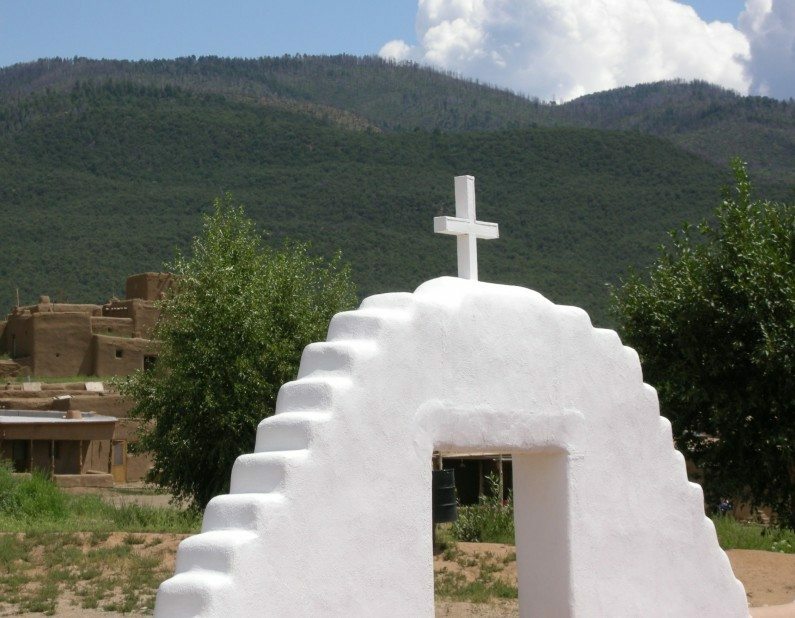 Filed under: Taos Pueblo: Ancestral Places, Sacred Spaces, The Photography	RSS 2.0 feed.